WADESBORO — The deadline is quickly approaching for middle-school students to apply for an all-expense paid scholarship from Pee Dee Electric to attend summer basketball camp at two of the state’s largest universities. Pee Dee Electric is awarding two Touchstone Energy Sports Camp Scholarships to local students this year. One young man will be selected to attend the Roy Williams Basketball Camp June 20-24 at the University of North Carolina in Chapel Hill, and one young lady will win a scholarship to attend the Wolfpack Women’s Basketball Camp June 14-17 at N.C. State University in Raleigh. Applications must be received or postmarked by March 31. At camp, students will work directly with the players and coaches to learn basketball skills and about leadership and teamwork. To be eligible to apply, students must be in the sixth, seventh or eighth grade during the 2015-2016 school year. Applicants must have permission from a parent or guardian to attend the overnight camp and must provide their own transportation to and from the camp if selected to attend. Applications and more information on the scholarships can be found at www.ncelectriccooperatives.com/community, or by contacting Anne Edwards at 704-694-7608. Applicants will be judged on academics, extra-curricular activities and an essay. Winners are expected to be announced by May 1. The Touchstone Energy Sports Camp Scholarships provide a one-of-a-kind educational and athletic opportunity to our state’s youth and reflect Touchstone Energy’s core values of accountability, integrity, innovation and commitment to community. 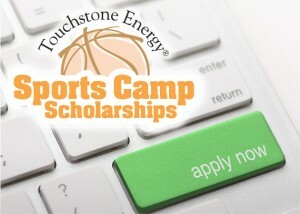 North Carolina’s Touchstone Energy cooperatives will award more than 50 sports camp scholarships to students statewide this year. Pee Dee Electric is a not-for-profit cooperative whose goal is to provide reliable, dependable electric service for its members while focusing on value, quality customer service, and enhancing life in the communities we serve. Pee Dee’s service area consists of Anson, Richmond, Union, Stanly, Montgomery, Moore, and Scotland counties. For more information about Pee Dee Electric, please visit www.pdemc.com.